Feed A Crowd With These Tasty Little Sliders! Around here we love sliders – they’re super tasty and tons of fun, and, though miniature, there is nothing little about their flavor! 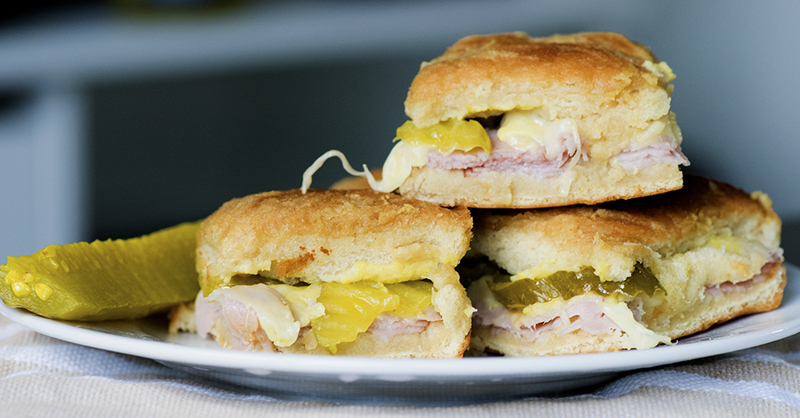 For this batch we loaded an entire sheet of sweet Hawaiian rolls up with classic Cuban sandwich flavors, including ham, swiss cheese, and plenty of dill pickles, then topped them with a buttery mustard sauce that was ahhhmazing. These little gems take no time to whip up and are always a crowd pleaser, making them perfect for parties, potlucks, and game day get-togethers. Just be sure to make a big batch, because they’ll be gone in a flash! Preheat oven to 325º F and lightly grease a 9x13-inch baking dish with butter or nonstick spray. Remove Hawaiian rolls from packaging and, without pulling rolls apart, slice entire slab in half and place bottom half in baking dish. Layer with meat, cheese slices, and pickles, and top with other half of rolls. In a medium bowl, whisk together butter, minced onion, and dijon, then spoon over tops of rolls. Cover with foil and bake for 10 - 15 minutes. Remove foil and bake an additional 10 minutes or until rolls are browned. Remove from oven, serve warm, and enjoy!